Down-to-earth, full of playful twists of language, and woven from grand themes in an accessible, appealing way, these poems pierce the heart and delight the mind. Not one word is wasted. LUCIA PERILLO, a 2000 MacArthur Fellow, has published three previous collections: "The Oldest Map with the Name America, The Body Mutinies, " for which she won the PEN/Revson Foundation Poetry Fellowship and several other awards, and "Dangerous Life," which received the Norma Farber First Book Award from the Poetry Society of America. Her poems have appeared in such magazines as "The New Yorker," the "Atlantic," and "The Kenyon Review." 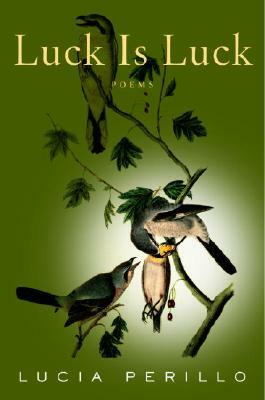 They also have been included in the Pushcart and Best American Poetry anthologies. "I have two words for anyone who wants to know why people turn to poetry in times of need: Lucia Perillo. She's the funniest poet writing today, which is saying a lot, since she's also the poet most concerned with the treachery practiced on us daily by our best friends and worst enemies, our bodies. . . . [Luck Is Luck offers] one exquisitely wrought poem after another."